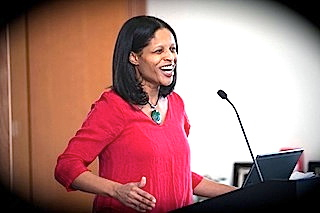 Home » Calendar » 20/21 Century & RGSS Colliquia present Margo Natalie Crawford: "Mood Books: The Textual Production of Black Feeling"
Professor Margo Natalie Crawford of the University of Pennsylvania received her Ph.D. from Yale University’s American Studies Program. She is a scholar of 20th and 21st century African American literature and visual culture and global black studies. Crossing boundaries between literature, visual art, and cultural movements, her scholarship opens up new ways of understanding black radical imaginations. Her other research interests include performance studies, queer theory, comparative ethnic studies, radical feminism, and transnational modernism. Her most recent book is Black Post-Blackness: The Black Arts Movement and 21st Century Black Aesthetics (2017). Her earlier work includes Dilution Anxiety and the Black Phallus (2008) and New Thoughts on the Black Arts Movement (coedited with Lisa Gail Collins, 2006). Black Post-Blackness compares the black avant-garde of the 1960s and 70s Black Arts movement and some of the most innovative spins of 21st century black aesthetics. Black Arts movement writers and visual artists are compared to a wide range of African American visual artists and writers who are at the forefront of 21st century black aesthetics. She shows that the mood of the 1970s “second wave” of the Black Arts movement is as “black post-black” as the cultural mood of 21st century black aesthetics. Her essays appear in a wide range of books and journals, including The Psychic Hold of Slavery, The Trouble With Post-Blackness, Want to Start a Revolution?, The Modernist Party, The Cambridge Companion to American Poetry Post-1945, Callaloo, American Literature, Black Renaissance Noire, Black Camera, Publishing Blackness, and the exhibition catalog for the 2013 AfriCOBRA exhibit at the DuSable Museum. She is on the editorial board of the Society for Textual Scholarship, the James Baldwin Review, and the Wiley Blackwell Anthology of African American Literature. She is now completing What is African American Literature? Through a focus on textual production, diasporic tensions, and the ongoing, repetitive production of the contemporary, What is African American Literature? shows how tensions between the material and ephemeral make the textual production of African American literature become the textual production of black affect.